Finally, after a long time, Xiaomi bring new generation MI band in India. Today the Chinese band launched the MI band 2 together with the MI Air Purifier 2 in Delhi Event. Recent smart band sports has a lot of improvement over its old version.It is integrated with OLED display and capability to measure heart rate. 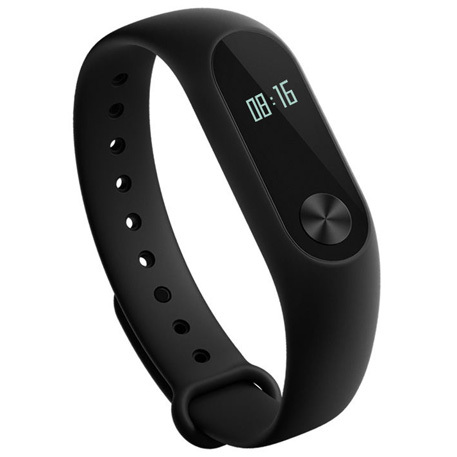 This Buy Xiaomi Mi Band 2 on sale that starts on sept 27 for 1999 only on mi.com and amazon. The new Mi band 2 feature a new sports look and an innovative touch button with new pedometer algorithm.A pedometer is a portable electronic device, that counts each step of a person by detecting the motion of land and hips.Most important thing is the detection of the last step and helps in the most accurate measurement of your daily work activities and exercises, Along with this it would cancel the unwanted movements. The new .42 inch OLED display show the clock with heart rate and the number of footsteps along with battery percentage left over in the band. It is packed with heart beat sensor and inbuilt motion detector. This help to monitor your pulse rate perfectly automatically during daily movements. It even deducts when you sleep by observing your heart rate periodically and understand the pattern and detect the anomaly. The smart wear can recognize if you sit idle for a long time, alert you to take a short break via gentle vibration. If you are thinking to Buy Xiaomi Mi Band 2 on sale from mi.com or amazon read all term and condition properly. Most important thing for this band is battery life. Its battery life is expected for 20 days on a single charge. It is highest among all competitor till now. On the paper, the battery used in the band that is lithium polymer battery cell has the capacity of 70 mah. It is certified from Sporting IP67 which indicate that it is resistance to damage from liquid and dust. It utilizes Bluetooth 4.0 BLE. It weighs around 70 gram only and comes with hypo-allergic silicon band. The original Mi Band was priced at Rs. 999 in India and launched back in April 2015 . The Mi Band 2 was initially launched in china in June 2016. Buy Xiaomi Mi Band 2 on sale start on 27 sep on mi.com and later from 30 sep it will be available on amazon India website.